Welcome once again to the weekly Vanguard update! Due to so many cards being revealed over the past few days this week’s update will be split into multiple parts. 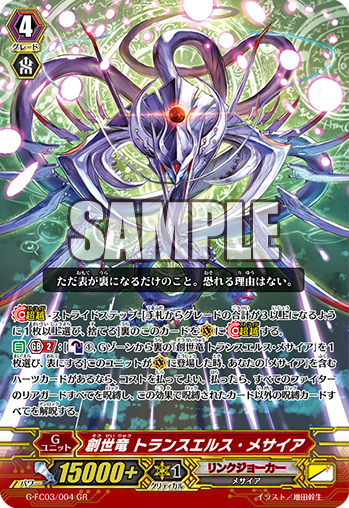 This part will be going over the new Link Joker and Gear Chronicle shown for G-BT05 Moonlit Dragonfang as well as a Link Joker stride from the new Fighter’s Collection. “The Clown” (Chaos Breaker Dragon) himself has had a nice bit of support with the new “Chaos” cards. Death Star-vader, Chaos Universe allows you to choose one of your opponent’s empty rear-guard circles and they have to choose a card from their hand, place it on that circle locked, then if the number of face-up cards in your G-Zone is two or more you can lock another of their rear-guards. Not only does this allow you to use up your opponent’s hand but it also gets around the problem of them keeping their cards away from locking danger. This card only costs Counter Blast 1 and a G Persona Blast to use its skill and with Chaos Breaker Dragon’s skill you can retire cards that have just unlocked allowing for you to take advantage of those empty circles. Star-vader, Chaos Bringer is a good option for a backup Grade 3 in Chaos Breaker decks. This card has Limit Break 4 (Yeah, remember that?) 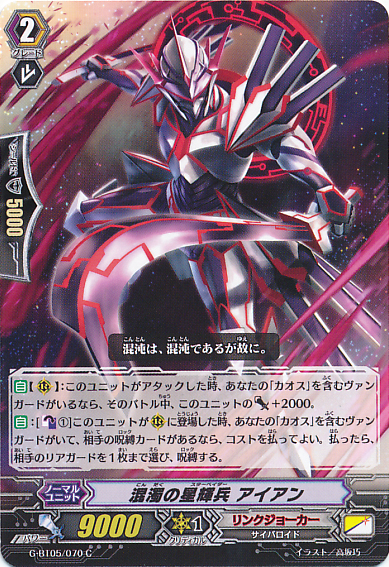 and at the beginning of your opponent’s main phase, if they have two or more locked cards you may, Counter Blast 1 to search your deck for “Star-vader, Chaos Breaker Dragon” and ride it as stand. He also has the ability to Counter Blast 1 to lock an opponent’s back-row unit to make this skill more consistent. Because this skill will take effect in the main phase it will still allow for the Soul Blast of Chaos Breaker to retire your opponent’s card at the end of their turn and draw a card as well as Chaos Bringer helping to fill up the soul. 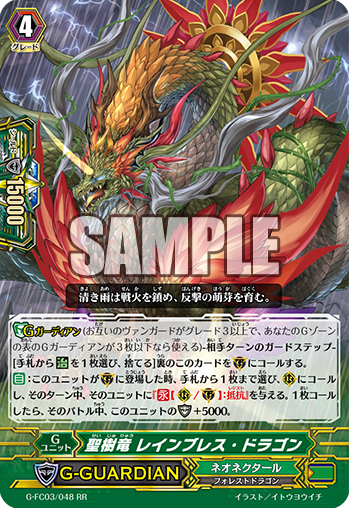 People may want to use Infinite Zero Dragon instead for the easy double lock but Chaos Bringer is a strong card in its own right and has great searching capability which is what everyone wants in a deck. To get that second locked card to pull off Chaos Bringer’s ability you could use Disorder Star-vader, Iron who has the on-call ability to Counter Blast 1 and lock an opponent’s rear-guard if they already had a locked card. This only works if you have a “Chaos” Vanguard and with the Counter Blast 1 you may think that he’s just a worse Photon but he has another ability that gives him +2000 power if you have a “Chaos” Vanguard, making him an 11k locker. There is also some more generic Star-vader support. Star-vaders get a new forerunner named Intricacy Star-vader, Carbon. If your opponent has a locked card then you can put Carbon into the soul to search your deck for a Grade 1 or less “Star-vader” and call it to rear-guard. Using this to bring out Confusion Star-vader, Zinc to help out for Chaos Breaker fuel or Eclipse Star-vader, Charcoal to be constantly in Limit Break will help you out a lot. Some people may not want to leave their first love of Dust Tail Unicorn though I personally prefer the idea of Carbon’s search and no Counter Blast. 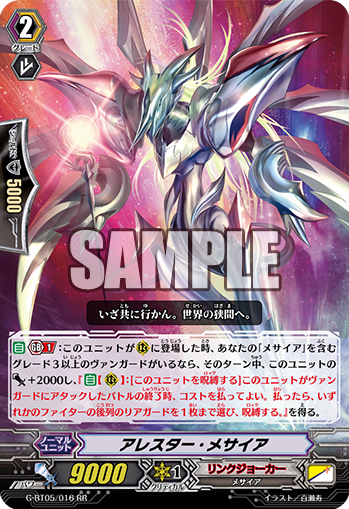 Star-vader, Paradigm Shift Dragon is a Critical Trigger that may be put onto the top of the deck to lock a card on your opponent’s back row and then shuffle your deck. 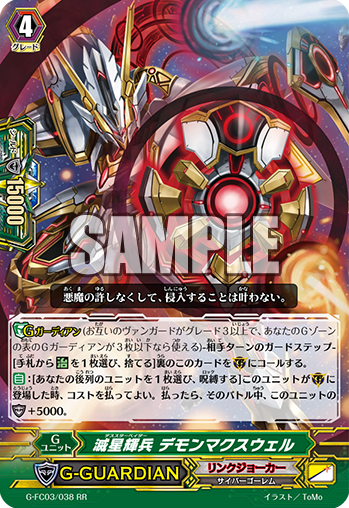 This does put a 10000 shield back into your deck but with Dark Zodiac and Glendios as your Vanguard this is can help you achieve World’s End. 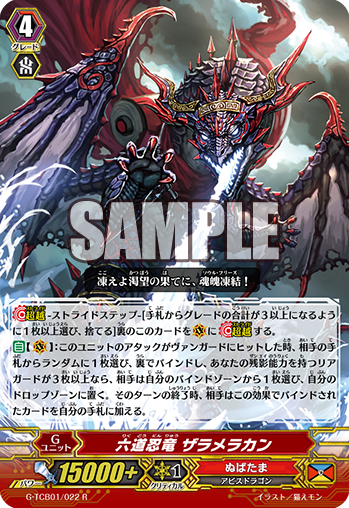 The Fighter’s Collection card that has been shown is also a Star-vader and helps with Infinite Zero Dragon like Cleanup Star-vader, Bromine did. Death Star-vader, Quintessence Dragon is a stride unit who when he is placed on the Vanguard circle and you have a heart with “Infinite” in it’s name it gives you the option to Counter Blast 1 and Soul Blast 1 to lock an opponent’s rear-guard in the front and back row and then if you have four or more damage those units can’t be unlocked in your opponent’s next end phase. Currently the only “Infinite” Grade 3 there is for Link Joker is the break ride, Infinite Zero Dragon, but hopefully we will be getting a new Grade 3 “Infinite” in the near future. 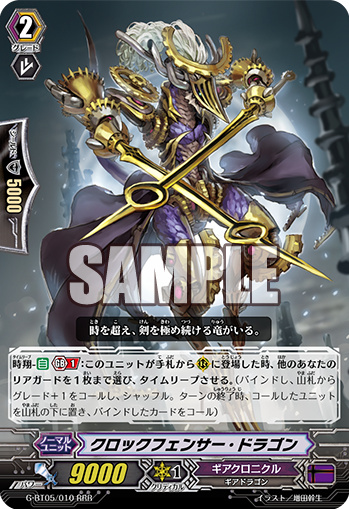 Onto Messiah’s Link Joker we have a rear-guard that prevents your opponent from unlocking a unit at the end of their turn. When Meteor Monk of the Violence Foot is unlocked you may Counter Blast 1 to choose an opponent’s locked card and keep it locked until for an extra turn. The great thing about this is you can keep doing it (Provided you’re willing to spend your Counter Blasts on it) and potentially continue to lock down an opponent’s column. 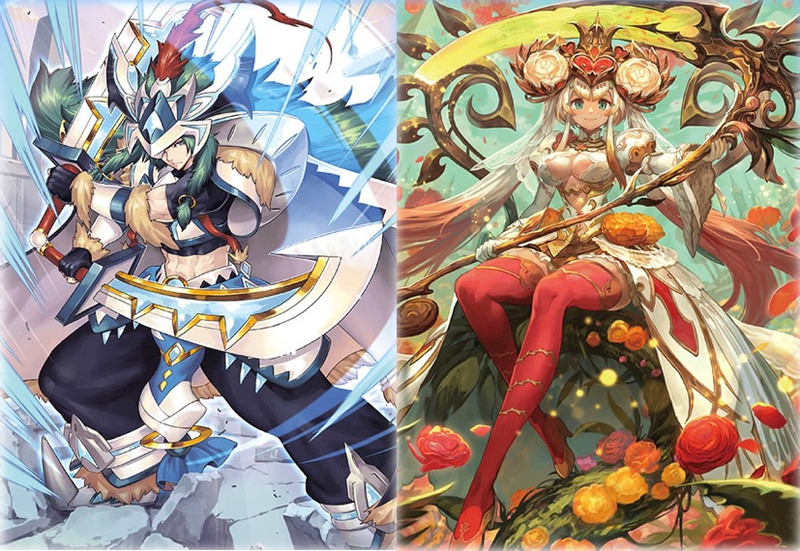 Mirror World Lion and Divide Monk of the Cliff Fist are two interesting units for Link Joker. They both have the skill of when they’re unlocked you may Counter Blast 1 and retire them to search your deck for two copies of the same card and call them to rear-guard. Now they both have Generation Break 1 and Mirror World Lion is a Grade 3 making it a bit risky to use his skill because that’s getting rid of three Grade 3s that you could use to stride. 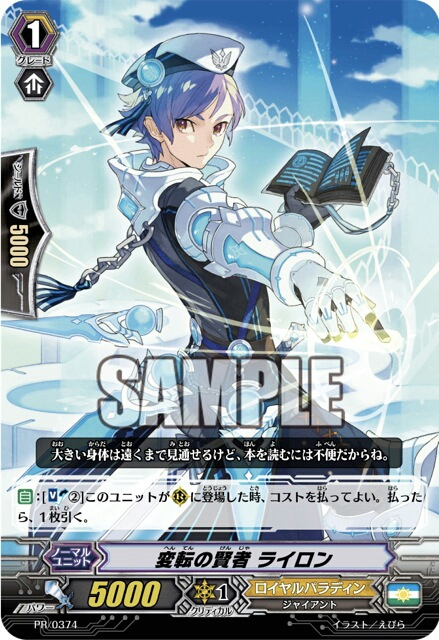 Divide Monk on the other hand is a Grade 1 and he really helps out with maintaining a good boost to your cards with his Neo Nectar-like skill. 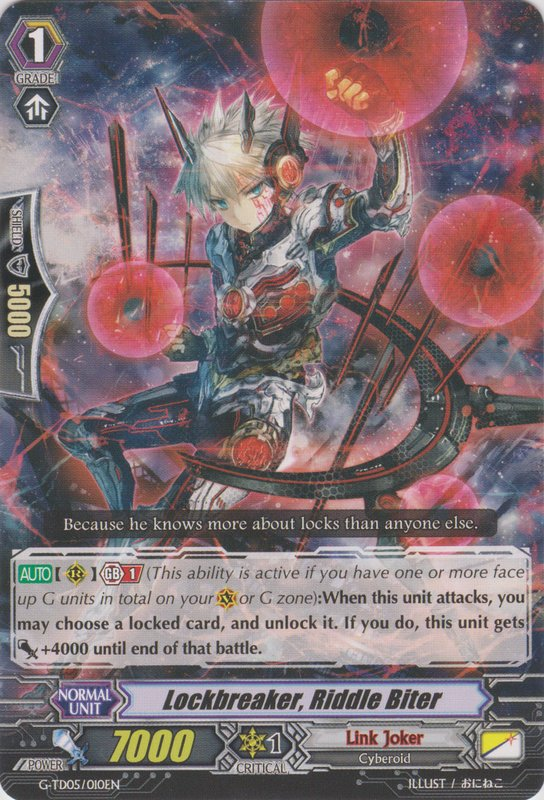 A more useful Grade 3 for Messiah decks is Lady Battler of the Accretion Disk which, when her attack hits and you have Generation Break 1, you may lock one of your own rear-guards to then lock one of your opponent’s rear-guards. Her skill works both on the rear-guard circle and the Vanguard circle so no matter where she is she’s never just a vanilla. Combine this with Heaven-sent Child of Gravitational Collapse and you’ll have some seriously good self-locking capability. Heaven-sent Child also gives you a draw when you lock a rear-guard but you have to Counter Blast 1. There may be a lot of Counter Blasting but you can even that out with the new Starholder Dragon that Counter Charges 2 when his attack hits if you’re at GB1. This is a card that a lot of different clans need and hopefully we’ll see some more of it in the future. 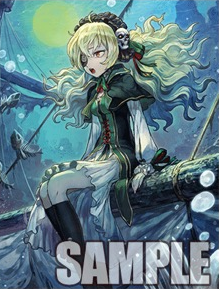 Gear Chronicle have had a few new cards including a Grade 1 version of Upstream Dragon, Steam Maiden, Melem. 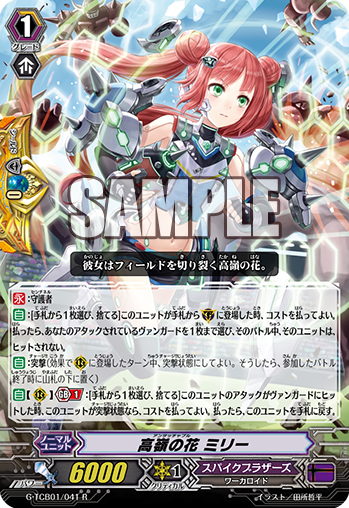 With a GB1 when she attacks you can give her +4000 power and after that battle put her into your deck, search for a Grade 0 and call it to rear-guard circle as rest and then shuffle your deck. 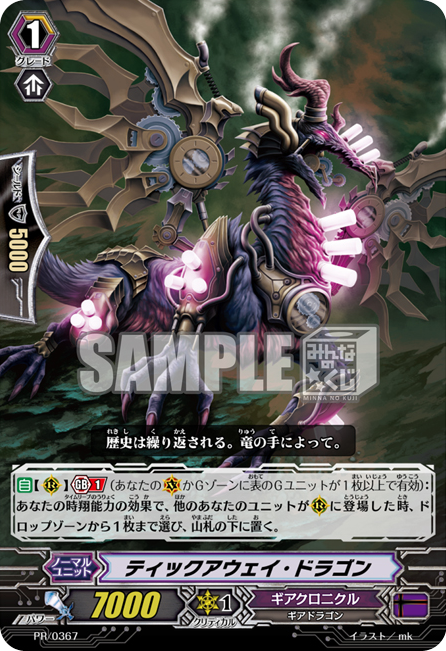 There are multiple Grade 0s that work well with being brought out with this such as Brass-winged Gear Hawk, Heart Thump Worker, Vainglory-dream Gear Cat, and even the new Stand Trigger, Steam Battler, Ur-watal. 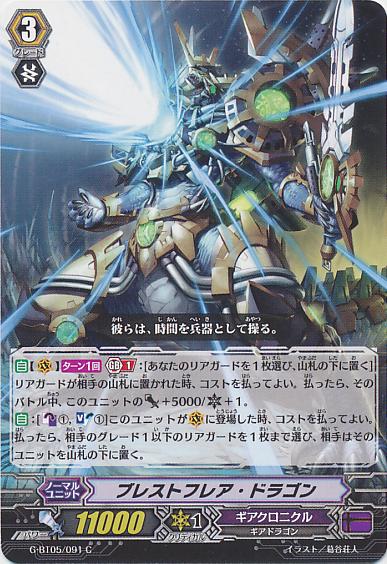 Ur-watal is great for using Time Leap on for when he goes to the bind zone you can put him on the bottom of your deck to draw two cards and then choose one card from your hand, return it to your deck, and the shuffle your deck. Gear Chronicle also get a new stride, Fiery March Colossus. 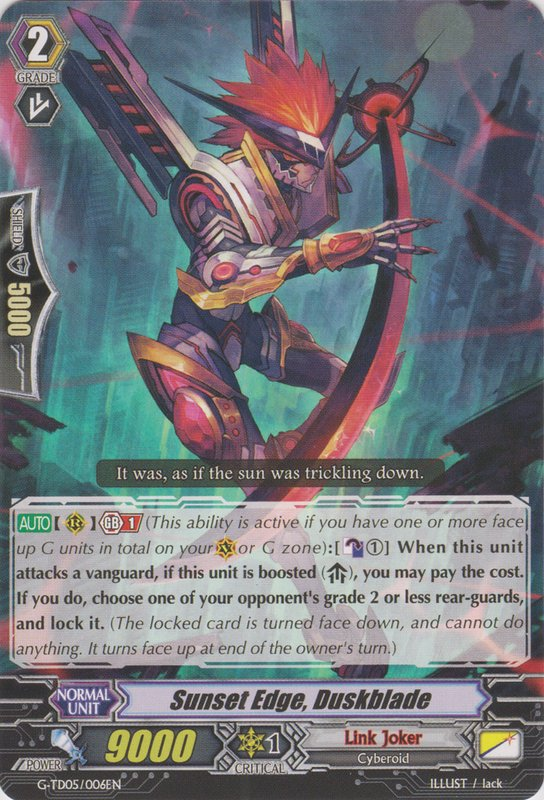 When this unit attacks you may Counter Blast 1 and put one of your units to the bottom of your deck, you then put one of your opponent’s rear-guards to the bottom of their deck and then they can’t guard with the same Grade as that unit until the end of battle. This will prevent your opponent from perfect guarding your G-Unit which is amazing for a single R.
Two Gear Grade 3s have been shown, Brestflare Dragon and Hammering Hammer Colossus. 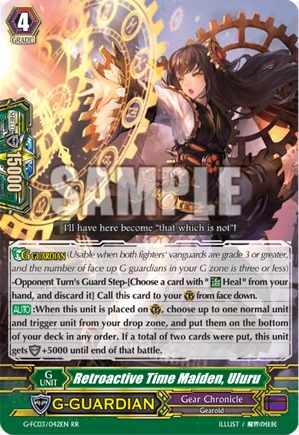 Brestflare gets +5000 power and +1 Critical every time a rear-guard that your opponent controls is put to the bottom of their deck if you pay the cost of putting one of your own rear-guards to the bottom of your deck. When he is placed on the Vanguard circle you may Counter Blast 1 and Soul Blast 1 to put one of your opponent’s rear-guards to the bottom of their deck, allowing you to to activate the first skill. Hammering Hammer Colossus can Time Leap a unit when his drive check reveals a Grade 3. Both of these are good Grade 3s but I can imagine most people will stick with Chronojet and Balih or the Legions for Grade 3s. Steam Knight, Lugal has a Silent Tom-like skill. When he is place on a rear-guard circle with GB1 you may Counter Blast 1, if you do he gains +2000 power and your opponent cannot guard with Grade 0s. With Time Leap you can bring him out repeatedly and continue to use his skill to make a beefed up Tom every turn. To help with having enough damage to Counter Blast you could use Steam Fighter, Mesh-he and Steam Fighter, Ur-ningin. Lost City Dragon is a great defensive option for Gears. When Lost City intercepts you may Counter Blast 1 to choose one of your opponent’s rear-guards and the put it at the bottom of their deck and then they search their deck for a card with one Grade less then that card and they call it. This is an awesome card for switching out a powered up card that your opponent has before they can use it like Doreen the Thruster or Upright Lion. 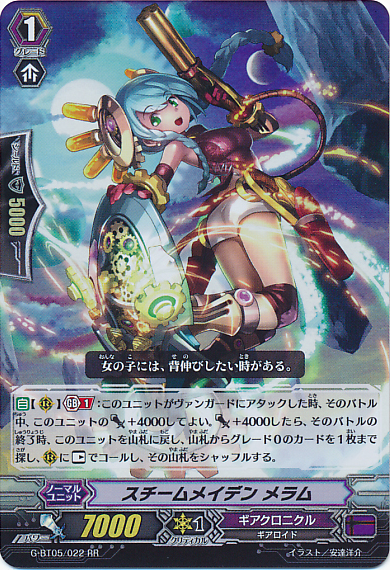 Another good card for defence is Steam Maiden, Balul who allows you to draw a card with a Counter Blast 1 when she is put into the bind zone. She doesn’t have a Generation Break but you may struggle to get her into the bind zone without it. 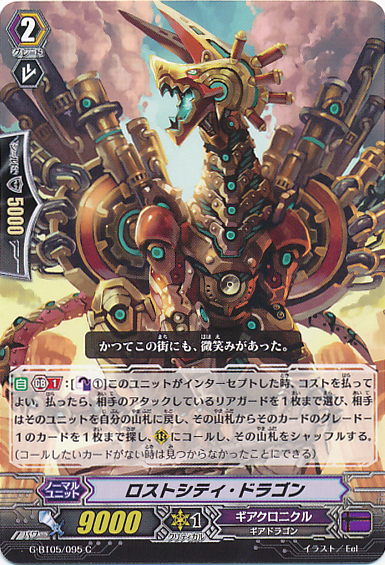 Steam Fighter, Ur-zaba gets a quick little boost in power when he is placed on a rear-guard circle where he gains +4000 power making him an 11k Grade 1. Steam Scara, Merkal would be a good card to target for Time Leap to bring Ur-zaba. When Merkal goes into the bind zone you can give a unit +5000 power. This can make some pretty strong columns with Ur-zaba and with Steam Worker, Etana who has the same ability as Merkal you can continue to grow your columns stronger. A skill you may be familiar with is Adaptation Gear Bat‘s skill of dropping and drawing when he is placed on rear-guard. He only has 6k power so he may not seem very useful in games these days but at least Gear Chronicle have this ability like nearly all the other clans. 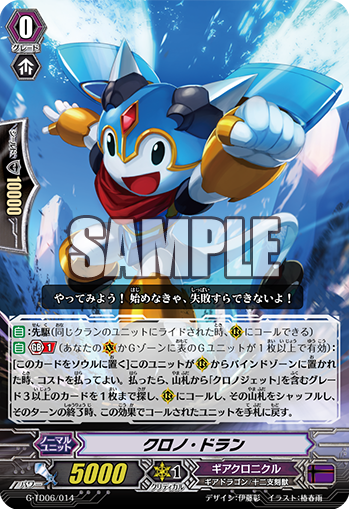 The only other G-BT05 Gears left is the vanilla Critical Trigger, Paradox Cannon Dracokid. That sums up all the cards for Link Joker and Gear Chronicle for G-BT05. 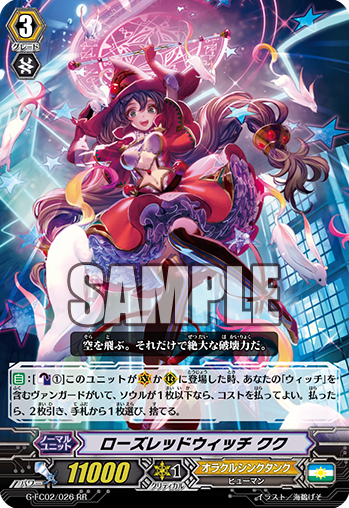 Be sure to check part 2 where I will be talking about the Oracle Think Tank and Pale moon in the same set as well as a sneaky look at a new Nightmare Doll stride in Fighter’s Collection 2015 Winter. 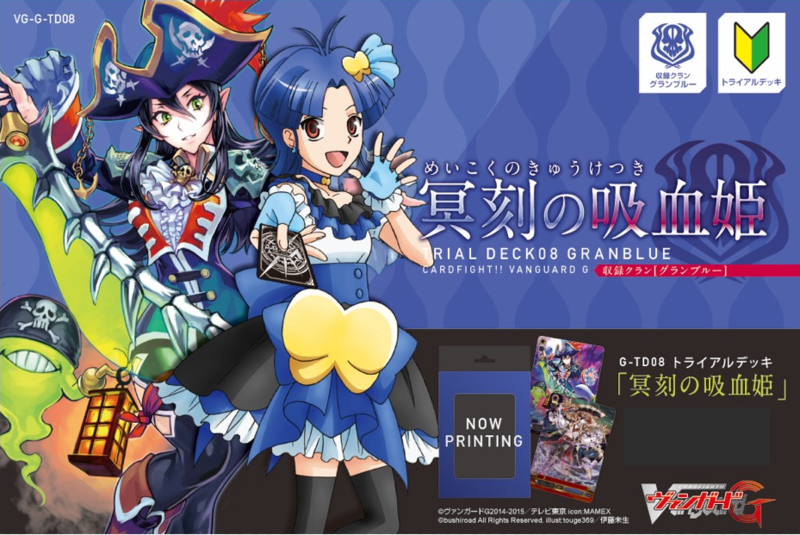 G Trial Deck 5 is on it’s way and will be our first glimpse of the new Link Joker cards. 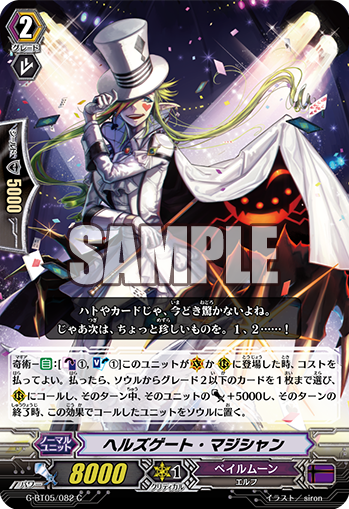 Messiah, originally seen as Harmonics Messiah (a Cray Elemental and the first ever G unit), is now the new leader of Link Joker. 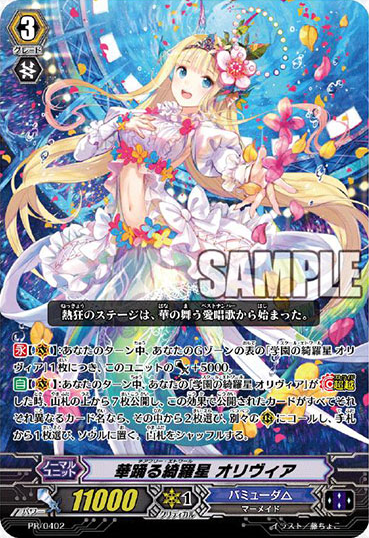 She takes many forms in this Trial Deck and will be getting another form in G-BT03. Despite this, Messiah is not treated as an archetype in this deck, with the possible exception of Neon Messiah (more on this later). 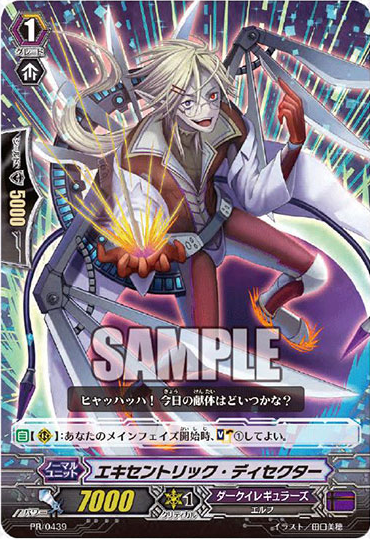 The new Link Joker not only focus on locking their opponents, but also locking themselves and gaining benefits from this tactic. Cards can lock each other to give power boosts to the users field. Further, some units have abilities that unlock others by force, which can also give power boosts. Coupled with these abilities are effects that trigger when a card is unlocked. This means you can gain power by locking a card, gain power by unlocking it, and finally gain an extra ability when that card is unlocked. Alter Ego Messiah is the feature Grade 3 of the deck. Her on-stride ability allows you to lock one of your opponents rear-guards and gain +5000 power at the cost of locking one of your own rear-guards and counter blasting 1. 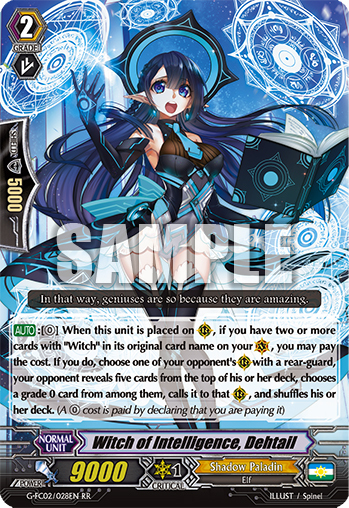 This goes really well with her Generation Break: when a card is unlocked, you can soul blast 1 and draw a card. Because the end of stride and unlocking are both timed at the beginning of the end phase, you can choose to put your G unit back in the G zone and then unlock your cards, so you can use Alter Ego’s ability to draw a card. 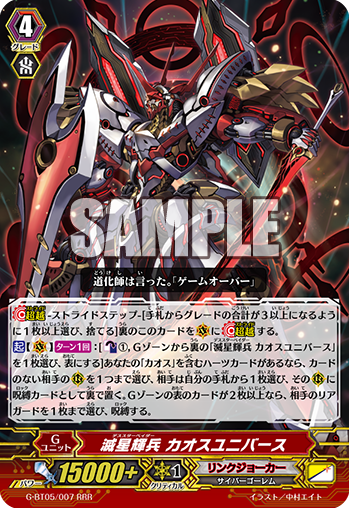 We also get a Messiah G unit in this deck in Genesis Dragon, Judgement Messiah, who has a standard on-hit ability. It allows you to lock one of your opponent’s rear-guards in the front row and then unlock one of your units. This allows you to unlock the unit locked by Alter Ego upon stride to give that unit a chance to attack or boost. This ability was shown in the anime when Ibuki used Gravity Well Lady Battler to lock the unit behind her and gain a power boost, and then used Judgement’s ability to unlock that unit so she could get the power boost for free. This left a second unit to be unlocked at the end of the turn for Alter Ego’s draw ability. The other Grade 3s we get in this deck are Astrobreak Dragon and Wings of Phenomenon, Wingmatter. Astrobreak gets +3000 if you counter blast 1, which can boost the attack power high enough to hit a 11k or 13k Vanguard if the unit behind him has been locked. 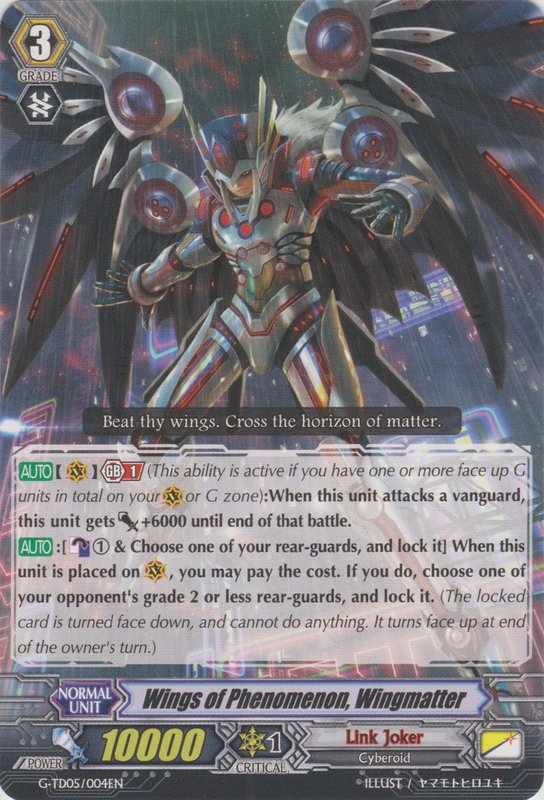 Wingmatter, on the other hand, has a more interesting ability: when he’s placed on the Vanguard circle, at the cost of locking one of your own rear-guards and counter blasting 1, you can lock one of your opponent’s Grade 2 or less rear-guards. This means even the weaker Grade 3s in the deck can cause some of your rear-guard abilities to activate once they have been unlocked. 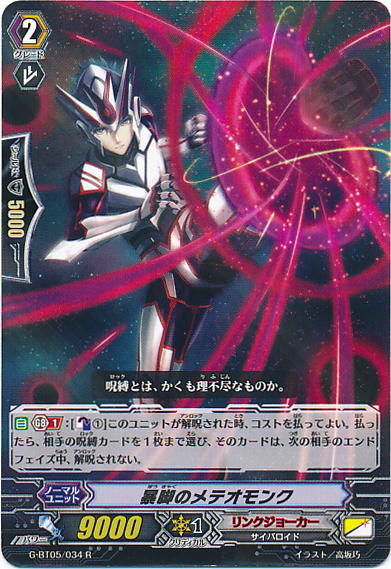 Additionally he also has a Generation Break 1 where he gains +6000 power when attacking a Vanguard. We get a good selection of Grade 2s in this trial deck. 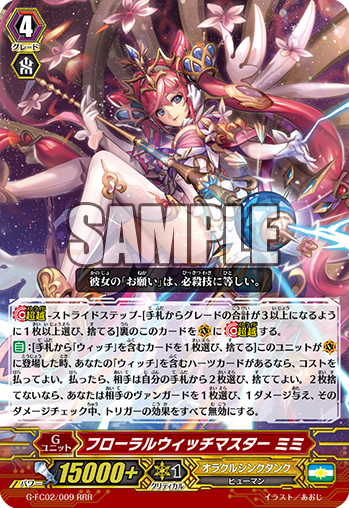 The first one to stand out for me was Sunset Edge, Duskblade, who is an extremely useful unit in most Link Joker decks. With his Generation Break 1 skill, when he attacks a Vanguard and is being boosted, you can counter blast 1 and lock one of your opponent’s Grade 2 or less rear-guards. For defence we have Lightspeed Cheetah which shows us that we will now be receiving 15k defenders in Trial Decks. If you lock one of your rear-guards that isn’t being attacked then this unit gains 10k shield when it intercepts. His power is only 8k, but this deck makes up for this with Gyre Flower, Dark Chakram, our new 12k grade 2 for Link Joker. All this self-locking becomes very useful with Awaking Messiah. When Awaking Messiah is unlocked, you can choose another rear-guard, stand it, and give it +2000 power. This especially benefits Duskblade because his skill is not limited to one use a turn. If you manage to hit with Judgement Messiah, then you will be able to unlock this card in the battle phase to make the most of it’s ability. 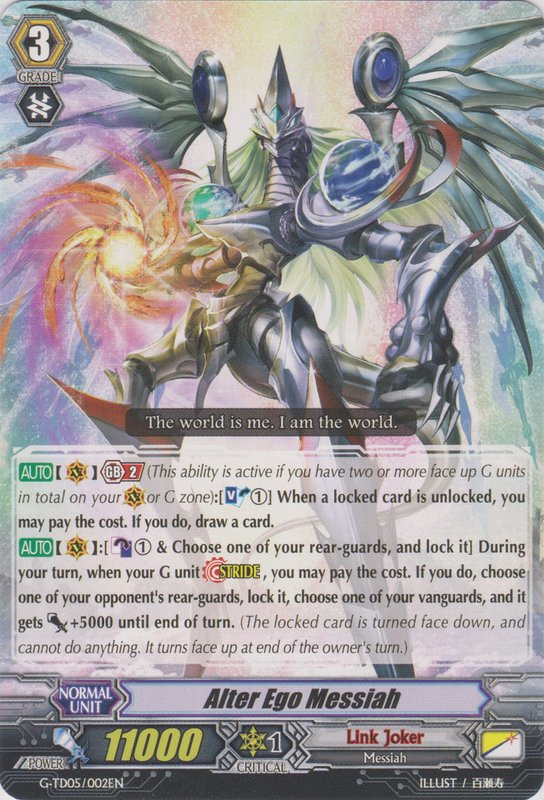 Using Amnesty Messiah from G-BT03 would also be a great way to unlock Awaking Messiah in the main phase. The Grade 1s in this deck are fairly basic. There may be no 10k vanilla grade 2, but there is an 8k vanilla grade 1 in Asleep Messiah. 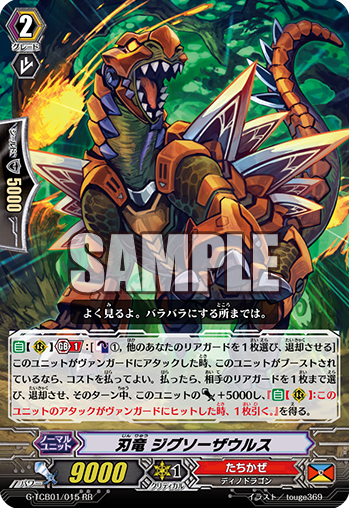 A 10k Vanguard booster, Protosun Dracokid, is included to add some offensive power to the deck. Our defensive cards are Lady Keeper of Virtual Reality, who is the perfect guard of this set, and Grab Hand Gorilla, who gains +5000 power when being attacked. Despite this, we do get one fairly interesting Grade 1. Lockbreaker, Riddle Biter allows you to unlock a rear-guard when he attacks and, if you do, he gains +4000 power. 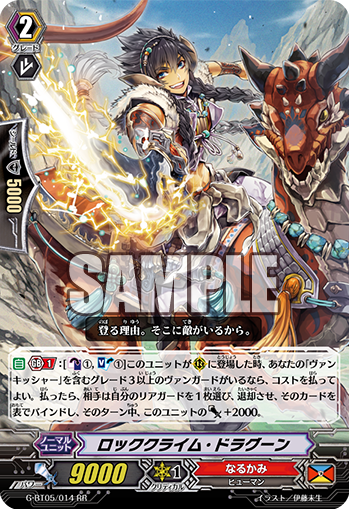 You could put him in the front row and put Awaking Messiah in the back row; then, once you unlock Awaking Messiah, Lockbreaker gains enough power to hit an 11k Vanguard and Awaking’s skill can activate. The second skill that activates once the unit is unlocked comes from the forerunner of this set. 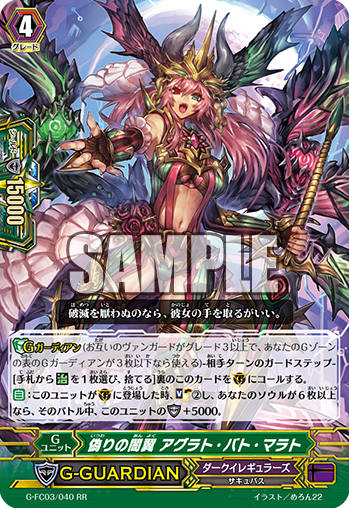 Neon Messiah, who shares her name with the movie, moves into the soul when she is unlocked and allows you to search your deck for a Grade 3 with “Messiah” in its name and add it to your hand. This card makes it easy and consistent to get the Grade 3 you want. 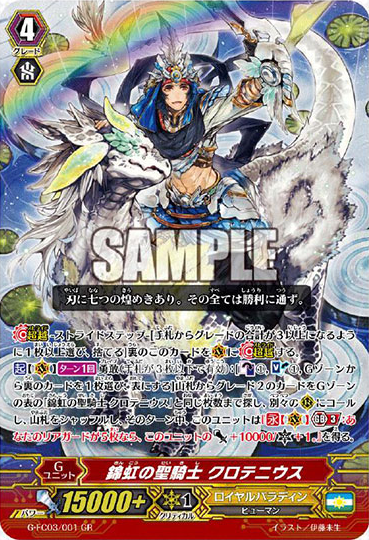 Beloved Child of Superstring Theory is the special trigger of the set, and can go into the soul to give +3000 power to another unit. This works well to set up Alter Ego Messiah’s cost of soul blasting. Once again it can be seen that Trial Decks are getting more and more powerful. I hope that they make these kinds of Trial Decks for more neglected clans such as Granblue or Tachikaze. 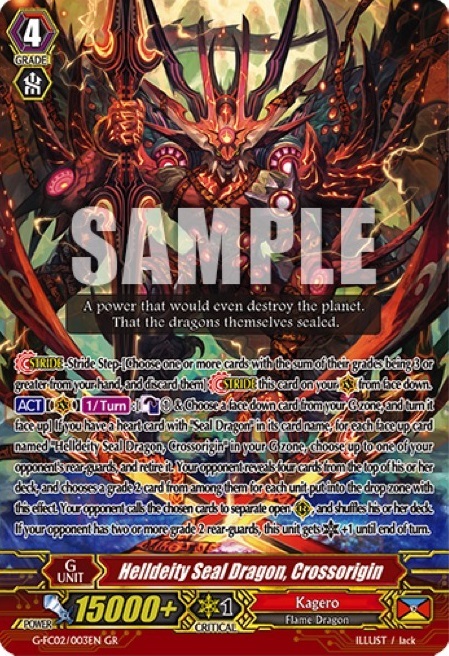 This deck, along with the next booster, G-BT03, demonstrates that Link Joker will be able to handle most match ups for quite a while, but it will still be interesting to see what kind of support Messiah will get in the future.